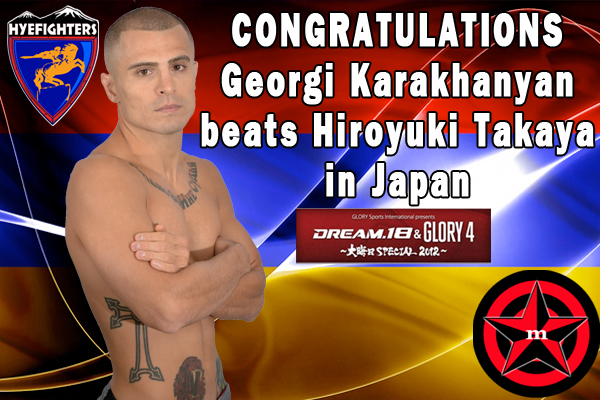 As the co-headliner of the merged DREAM 18 and GLORY 4 card, DREAM Featherweight champion Hiroyuki Takaya took on Bellator vet and TPF Champion, Georgi Karakhanyan. HyeFighter Georgi Karakhanyan took a split decision over Hiroyuki Takaya, although just about everybody watching and viewing in Japan believed it should have been a unanimous draw for the former Bellator competitor. Early in the opening round Karakhanyan landed a quick punch and immediately dropped Takaya. The Bellator vet continued to work with good ground and pound, until the Japanese fighter was able to recover and get back to his feet. The rest of the round becomes mostly a stand up battle this time. Takaya got some good shots in, but it’s Karakhanyan landing the more crisp shots and very good knees from the clinch. 2nd round was more of the same. Karakhanyan landed good kicks and right hands from distance, and excellent knees from the clinch. This went on for majority of the round, but with a little over a minute left, Takaya had the only good moment of the fight for him when he landed a good counter punch as Karakhanyan attempted a flying knee. The Japanese fighter was then finally able to mount some offense as he got on top and landed a decent amount of punches until the round ended. It wasn’t enough though. As the third started, Karakhanyan continued with the excellent combinations that has worked for him majority of the fight, until he decided to take Takaya down about a minute into the third. Karakhanyan landed some good ground and pound for several minutes as he continued the dominance against the Japanese champ. When the judges announced the final decision, one judge gave it to Takaya, which baffled even the Japanese fighter himself. The two others got it correct though, and we were able to avoid a controversial decision. Prior to the contest, Karakhanyan had won 5 straight bouts, winning and defending the Tachi Palace Fights featherweight title in the process. Takaya on the other hand, has won 5 of his last 6 fights. pleas maybe in Armenin we can red its?! Георги джан с победой мы всегда с тобой мы в тебя верим наш Безумец!! !